I had thought my Beyer cousin was descended from the Beiers in the 1736 fifth wave of Schwenkfelder immmigrants (a German religious group that came to Pennsylvania). However she had no DNA matches at all on that line when I connected her ancestor David Beyer b 1763 to the parents listed for him in many trees, Andreas Beyer, born ca 1733 Germany and Philipina Weyand. By comparison, my cousin has dozens of DNA hints to people descended from David’s wife Sara Crum’s parents and their ancestors. Of course there is always the possibility that someone else fathered her ancestor David Beyer or that my cousin just inherited none of his DNA. After all he is a 4th great-grandfather which is pretty far back. However since the paper trail to Andreas was not convincing, I disconnected David from him on all my trees and added another possible set of parents. Still no DNA hint matches there though. It might help if I had more ancestors on that new potential line. 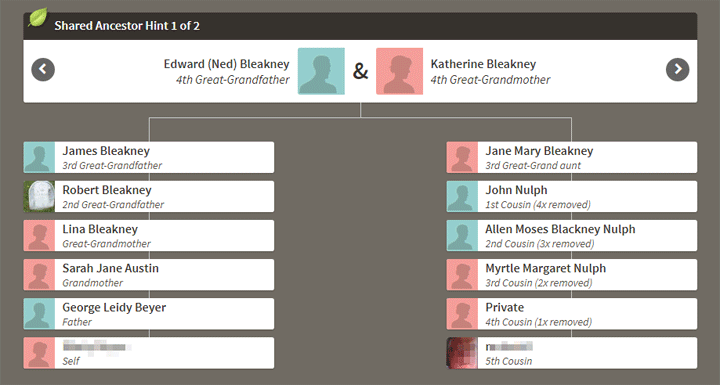 On the other hand when I connected her ancestor Robert Bleakney to a possible set of parents, James Bleakney and Mary Nolph, the matches came pouring in from both sides. There is no real paper trail for this relationship and James would have been 8 when he fathered Robert so I suspect one or both of their birth dates are wrong, probably Robert’s, since the DNA is very convincing. More research is needed. 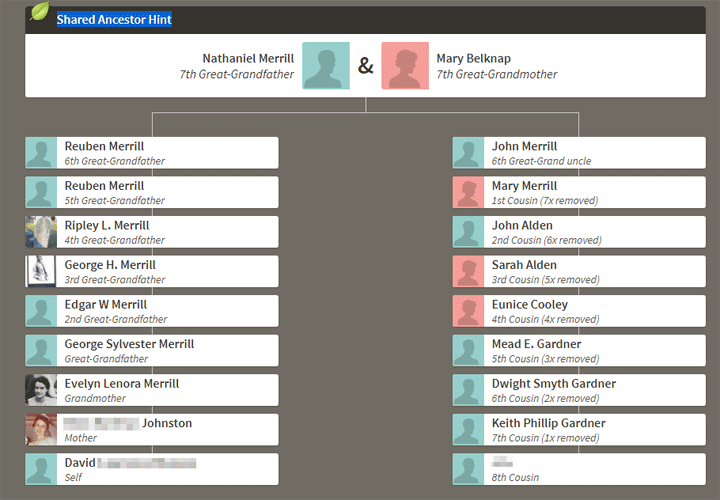 My third cousin Dave has one deep American line going back from his great grandad George Merrill. There are several men of that name in about the right time and place so I wondered if I could use Ancestry’s DNA hints to solve this puzzle. I had done my usual deal with Dave, I told him if he DNA tested, I would fill in his family tree for him. This is the only way I can afford to have so many cousins testing! I had initially built a tentative tree for him using George E. Merrill who I had thought was his ancestor, but this got no DNA hints at all. Now I felt awful since I had told Dave he was descended from a Revolutionary War soldier on that George’s tree. So I looked again and this time tried a tree using George S. Merrill. It helps to have other people to copy from who have these folk in their trees with ancestors, although I always try and double check the sourcing. A few days later when I got back to looking Dave’s results he had gone from a mere 5 DNA hints (we Norwegians do not have that many relatives at ancestry) to 14 hints. Somewhat amazed, I started looking through these Merrill descended matches and continued his tree back in time. Definitely this is the right George since he shares so many hints from different ancestors on this line all the way back to his 7th grandparents. This also explains his Van Alstine New Ancestor Discovery (NAD) since George S Merrill’s great grandad married Maria VanAlstine, the sibling of that NAD. These NADs, if you have any, show beneath the 3 panels on the DNA home page. Plus Dave now has several revolutionary soldier ancestors. All is well. Another byproduct of Ancestry ‘s powerful DNA matching, is that some people have discovered that their father or grandfather or great-grandfather is not the expected person by seeing that there were no DNA matches on that branch of the tree. Since it is always possible that no one else from that line has tested (likely with immigrants from less tested countries), it is always best to test another relative or two, who should be a match on that line, before reaching any conclusions. Recently, a young woman was helping an adoptee who was clearly her first cousin in the DNA on her paternal side (her mother is tested). She found the adoptee’s birth mother, not a match to her. So she assumed that their dads should be brothers, but her dad had no brother. Puzzled she consulted me. I pointed out to her that she did not have a single DNA match on her Dad’s side of her tree so either he was adopted, switched at birth or not her dad. Soon thereafter she discovered that her paternal aunt had tested and did not match her at all. Thankfully her discussion about this with her mother went well and the two birth dads are now known. Using Ancestry ‘s powerful DNA to tree matching is a clever way to prove or disprove a family branch but be prepared for surprises. I’m wondering if sometimes when a speculative tree generates many hints, if everyone has the wrong ancestral couple. In other words, yes, they are all related, but the assumed identity of a MRCA that has no paper trail, is wrong. Peggy, of course that is a concern but in both these cases the many DNA matches shared many different ancestors along the new line. That gives me more confidence than if they all descended from one specific couple. I’ve yet to notice that or how to do that. Can you show an example of someone who has a tree but has not linked it? Ok Ken I added an image in the article for you of how it looks when there is a tree on their match page that is not connected to the DNA and slightly updated the text. It’s simple. When you are looking at one of your matches and it says “no family tree”……..you with me so far? Well for some of them if you actually click on their name or username or screen name, then look towards the bottom of the screen in the big box it will have a little dropdown box that says select a tree to preview. Great post! I just added my 4th great grandpa — at least I think that Patrick Caine is father to my John Caine. I also added 2 of Patrick’s presumed children and I will see what I get! I’ve put my actual researching on hold the last couple of weeks so I could delve into and learn Genome Mate Pro but saw your post so just had to try it. At least my brain isn’t completely dead from all the DNA learning curve! Best to add Patrick’s parents and grandparents as well as this may get DNA match hints to his ancestors. Thanks for great tips on getting more out of Ancestry DNA. By the way, when viewing people’s trees there, I highly recommend the horizontal view–the extra step of clicking the little icon that makes the tree grow left to right instead of bottom up allows easily viewing their ancestors without the clutter of all their ancestors’ siblings and other relatives. I think the horizontal view should be the default view! JMO! Great information, Kitty. Does it make any difference which person and at what generation I attach my DNA to in the test tree? For example, could I attach my DNA to a person at my great grandmother’s generation and would this then allow me to extend my line beyond the 4th cousin limit Ancestry imposes? Could I attach both my sisters and my kit to the same test tree? Lastly, since we’re talking atDNA, does it matter whether I connect my/my sisters kit to a male or female in the test tree? Thanks. Try all these things and let me know! No difference what generation but not sure about the rest. I believe people can transfer his/her management rights to another. Once the transfer has occurred, the new manager should be able to add the DNA test to a tree already connected to other DNA tests. I have a tree with 14 tests attached to it. Not all of the tests are related to me. A couple of my dad’s first cousins’ spouses have wanted to test. I’ve added the first cousins’ spouses to the tree and attached their DNA to their names on my tree. Everything is working beautifully! Good timing …. my life is mirror tree’s these days! I wish more Norwegians would test! I feel like I am going nowhere with Kathy’s search 🙁 I’ve got a forrest of mirror tree’s for her and one lowly shared ancestor hint … nothing closer than a 4th cousins. Then a kit I gave to an adoptee was processed this week and boom … almost 1300 4th cousins and closer with 9 2nd cousins and 39 3rd cousins!!!! I couldn’t believe my eyes!!!! Acadians from NFLD! Three day’s of this and I have almost got it figured out! Wow what a difference a day makes! Although I have been working on my DNA matches for a couple years now and also administer tests for about 20 other relatives, your blog has certainly opened my eyes to more that I could be doing. Great article. Thx. I have used this techique and have broken down a lot of my brick walls. In the suffix section, I type in working theory. I recently figured out a lot of my southern lines and that my DeMaughs were originally Dumonts from Kararouska, Quebec. It even works on Smiths’ from Smithville, NY. I know that I am a descendant of Richard Bull Smith. Love the wording of your message! Have you then seen anyone link their DNA to their tree? i just got my results back in Dec 2018. i think my tree is linked but i’m not sure. i went to the main page and only found “email settings and site preferences” as options. how do i make sure the DNA and the tree are linked? why do matches not respond to messages? i have sent simple hello we are a high match, who is our shared ancestor messages, with little response.! etic communities – solved some of the DNA circle mysteries. ; and search by surname or location. Since I have my mother’s line back 7 generation, searching by birth locations has found several DNA matches. If known it is important to put death information in the tree and not just names. Searching by surnames often brings up “private” trees that include the surnames. Nice Jeanne, another 8th cousin for my cousin! and yes those genetic communities can be a big clue. What is your experience with the accuracy of NADs? I have administrator rights to my mother and her brother’s Ancestry DNA, as well as my own. My uncle has a NAD that neither I, nor my mother have. It’s actually the only one any of us have. I am not finding the connection in my tree, but I do have a somewhat recent dead end. I apologize for missing your comment and not responding sooner. I’m looking for the names of my 2nd great grandfather’s parents. He was born in New Jersey in 1805. Census records state his parents were as well. The problem is, all of Ancestry’s DNA hints point to the 2nd great grandparents and most of them have the wrong parents. Will the above blog help with this? 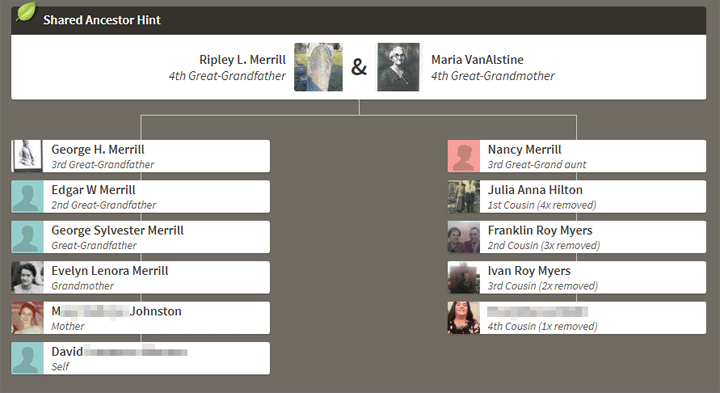 My 2nd great grandmother’s line is pretty well established back 3 more generations. This technique is quite dependant on accurate trees! 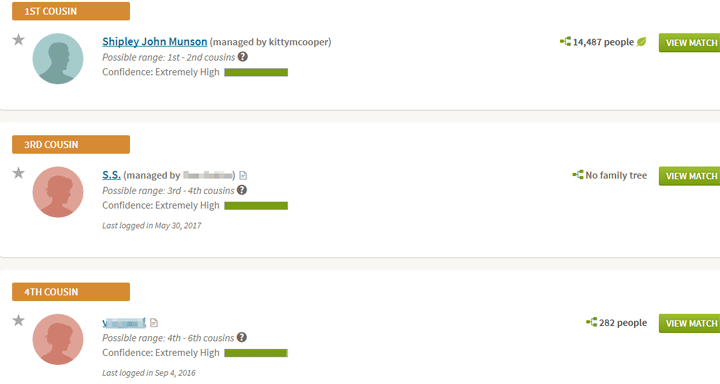 I logged into Ancestry today and was pleasantly surprised to find that on the matches page, Ancestry is now showing the shared cms and number of segments without having to click on the little black circle with the i in it! You can scroll down your list of matches and see all of your shared cms and number of segments all on one page. I am eagerly trolling through more pages looking for other new goodies! Yes that was a very pleasant surprise indeed yesterday. There are also some other new features: A beta map of where your matches live and the ability to compare ethnicities. So soon I will have to blog about all that! Curious, how many DNA hints is considered a good fit? Or is it relevant to each person’s case? I see your screenshot only shows 30 shared ancestor hints at the time this was written. Mine (deep American roots) has 330 at the moment on my known tree. Planning to move it around to some research trees like you did and wondering what range of DNA hints is decent. There is no magic number. You look at each hint and the amount shared to see if it fits the suggested relationship. Personally with a very deep tree, but 3 of my grandparents born in Europe (and the 4th to immigrants), I am grateful to have 39 hints. Some of my Norwegian cousins have far fewer. In the case of my cousin Dave he had only one colonial line from a great grandfather. Your number sounds normal for someone with a deep tree and colonial roots. However I am working with someone whose mother is of French Canadian descent with a good tree and he has 598 hints!